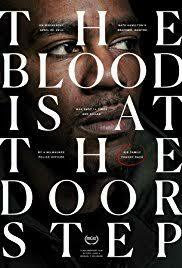 It’s been a year since I first caught Erik Ljung’s (SXSW 2017-premiering) The Blood is at the Doorstep (reviewed here by Chris Reed with an accompanying interview here) on the festival circuit. The doc’s title is a reference to the chant of activists who’d gathered outside the home of the Milwaukee attorney general after the senseless killing of a black man, in this case Dontre Hamilton, who was shot 14 times by a white officer with a history of community complaints. But if you think you’ve seen this heartbreaking, enraging story (too many times) before think again. 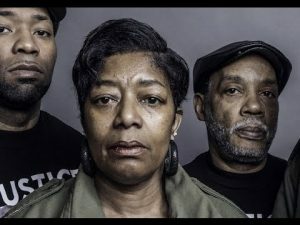 This was pre-Ferguson, and Ljung – a white guy, but also a Milwaukee-based filmmaker living not far from where Dontre died – gained access to the Hamilton family over years, in the process painting a powerful portrait of daily life for a grieving mother and brother long after the sound bite-scooping camera crews have gone home. I spoke to Ljung in-depth about the challenges he faced in telling a story he himself questioned whether he even had the right to tell. How did you, a white guy who had never shot a feature before, go about approaching the Hamilton family? Why did they trust you? I think that even as an “outsider,” it is important to have connections to the story. I have lived in Milwaukee for nine years, and live just a mile from where Dontre was killed. In fact, I used to work directly across the street. Not only do I live in the community where this story takes place, but I also come from a family who has had their own difficulties dealing with schizophrenia. There were assumptions that Dontre was homeless and that the family didn’t care about him, and I was personally offended by this sentiment that ran rampant on social media. My cousin has schizophrenia and is homeless in my hometown of Sonoma, CA, and I am a white man from a middle class family in a nice area. I don’t think people understand the challenges of dealing with a mental illness. From that perspective I am somewhat of an insider, although I think my family would have gotten a lot more benefit of the doubt and compassion than the Hamilton family received. I live far away from my family now, and I haven’t been there for a lot of that struggle, but I think working with the Hamilton family helped me learn about my own family as well. There are some obvious ways that I was an outsider to this story, but there were other important ways in which I was an insider as well. What were the challenges in telling this story? Did you ever question whether you were the right filmmaker for the job? I was constantly questioning myself if I was the right person to tell this story, and constantly worried that I might be missing something, trying to understand where my blind spots might be. I never came in with the assumption that I knew better than anyone else. I knew nothing and I was trying to learn. I am a white man living in Milwaukee, and my experience is very different from that of the Hamilton family who live just a mile from me. On top of that, I am not a father. I don’t know what it is like to raise a child, let alone bury one. There were many days I felt extremely guilty sticking a camera in front of this family during the worst period of their life. Dontre’s mother, Maria, formed a group of other Milwaukee mothers who had lost sons to police violence. I filmed their very first meeting, a tea party, where the mothers got acquainted with one another and shared their stories of how their sons were killed. Not only was I the only white person in the room, but I was also the only male in the room, and the only person who was not a parent. And most importantly, I was the only person in the room who had not experienced losing a child to police violence. After filming their tea party I did not go home that night feeling good about myself. I had a ton of self doubt that night about what I was doing – if I was the right person to be doing this, why was I doing this, what was I hoping to accomplish by showing this extremely intimate meeting to an audience of moviegoers, why was it necessary that anybody sees this. At the end of the day I had many discussions with the Hamilton family about this and why we felt it was important to share this story. The news constantly bombards us with images of black and brown bodies being killed by police, an official statement from police, and a blurb from the family – and then eight months later you hear another blurb about the district attorney not pressing charges. The script is predictable. Throughout the coverage of these cases we rarely hear the family’s side of the story, even though the character of the victim and their family is widely scrutinized. I, along with the Hamilton family, felt it was important to show what it is truly like for a family that is forced to join this club and the legal, media and reformative measures they must juggle while trying to deal with grief. It is easy for people to make assumptions about this family, or any family going through this, but I think if you had the opportunity to speak to these families you would realize how inspiring and courageous they really are. At the end of the day, Dontre was killed four months before Ferguson. There was not the media scrutiny on police shootings when Dontre was killed. There was no one else telling Dontre’s story other than the local nightly news, and it provided very little nuance. The Hamilton family took a chance on me, and over time developed a trust in me to tell their story fully instead of simply covering rallies – but that level of trust and comfort did not come overnight for either myself or the family. As someone who is not part of the black community in Milwaukee, did you ever find you got access that an “insider” might not have? I was just thinking that sometimes it’s easier to open up to strangers than to those closer to you, whose opinions and judgments cut deeper. I think that it is important to approach and tell these vital social issue stories many different ways and from many different perspectives. No one documentary is going to reach everyone and change the system, but I hope that together with other films covering these incidents there will be a groundswell of greater awareness of the nuanced stories behind the news headlines. Watching Whose Streets? it was painful to see some of the scenes in that film are devastatingly similar to how the case played out in Milwaukee as well. It is important to understand that these are not isolated incidents, these are happening in every community in this country. There are an estimated 1,200 killed by police each year, so for every case you have heard of, there is probably another 100 that you haven’t. Regarding access, I think being an outsider might lend you a certain perspective that someone from within a certain community might not realize, and on the flip side of that, being an outsider you are going to be blind to even more. Being an outsider in this story did not particularly allow me greater access to the family per se – but being an ingrained and trusted member of the Milwaukee community allowed me the opportunity to be able to collaborate with them to tell their story. We did film with politicians, police and supporters of police as well. At the end of the day everybody was wary of my intentions. I think that no matter who you are you should be protective of who gets to tell your story, and trust has to be built between all parties involved. 2017 SXSW Film Festival, Dontre Hamilton, Ed Flynn, Erik Ljung, Lauren Wissot, Milwaukee Chief of Police, police shooting, police shooting unarmed black men, Police violence, schizophrenia, shot 14 times in Milwaukee, The Blood is at the Doorstep, The Ones Who Walk Away from Omelas, Ursula K. Le Guin, Whose Streets?